The “Working your Fingers to the Bone” conference on the 6th to 8th of July, 2016 was organised with the aim of bringing together researchers interested in disease, injury and other effects of occupations (in the broadest sense) on the human skeleton and dentition to improve the interpretation of these changes in archaeological and forensic contexts. Identifying occupation, task division and activity-patterns from skeletal remains past populations and using this to assist forensic identification, has been an alluring prospect in bioarchaeology (biological anthropology) from its earliest inceptions. Some occupation identification can be made by pathognomonic changes, e.g. “phossy jaw” which was characteristic of those working with white phosphorous in the matchstick industry, however, the majority of skeletal changes cannot be ascribed to a single task or occupation, e.g. entheseal changes or cross-sectional geometry. Recent research has highlighted that the multifactorial aetiology of many skeletal changes previously used to identify activity-patterns cannot be applied simplistically. 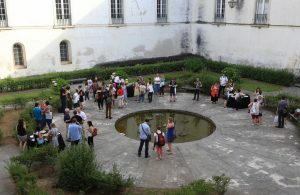 The conference, organised by Charlotte Henderson (CIAS), Ana Luisa Santos (CIAS and Department of Life Sciences, Coimbra), Francisca Alves Cardoso (CRIA), Sandra Assis (CIAS and CRIA) and Maria Alejandra Acosta (CEF and Laboratory of Forensic Anthropology, Coimbra) consisted of 5 keynote lectures, 23 oral presentations and 13 posters. Institutions from 19 countries were represented by the participants and these included institutions in Europe, North and South America and Asia. A total of 83 people attended the meeting, 38 of whom were students. Details of the conference content, including the programme can be found on our website: http://www.uc.pt/en/cia/events/Occupation_Conference_2016/. In conjunction with this meeting a workshop training people in the new Coimbra method for recording entheseal changes was also run led by Cynthia Wilczak (San Francisco State University, USA) assisted by Charlotte Henderson and Maria Alejandra Acosta. Due to high demand (52 people attended) three sessions were held, including a session on the 9th of July.